The Purpose Driven Life is far more than just a book; it is a guide to a spiritual journey. Once you take this journey, you’ll never be the same again. On your journey you’ll find the answers to three of life’s most important questions:The Question of Existence: Why am I alive? The Question of Significance: Does my life matter? The Question of Purpose: What on earth am I here for? Living out the purpose you were created for moves you beyond mere survival and success to a life of significance-the life you were meant to live. Five benefits of knowing your purpose: It will explain the meaning of your life.It will simplify your life. It will focus your life. It will increase your motivation. It will prepare you for eternity. This new, expanded edition has been created for a new generation of readers. SUBTITLE: What on earth am i here for? 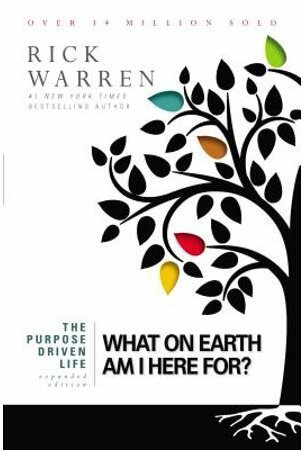 SUMMARY: The Purpose Driven Life is far more than just a book; it is a guide to a spiritual journey. Once you take this journey, you’ll never be the same again. On your journey you’ll find the answers to three of life’s most important questions:The Question of Existence: Why am I alive? The Question of Significance: Does my life matter? The Question of Purpose: What on earth am I here for? Living out the purpose you were created for moves you beyond mere survival and success to a life of significance-the life you were meant to live. Five benefits of knowing your purpose: It will explain the meaning of your life.It will simplify your life. It will focus your life. It will increase your motivation. It will prepare you for eternity. This new, expanded edition has been created for a new generation of readers.